Kryptonite Big 470 Pack includes a bottle of both our Kryptonite Naked Glass and Bong Cleaner 470ml and Kryptonite Cannabis Extractor Cleaner 470ml for those cannabis growers who also like to consume. Both of these bottles come equipped with our re-engineered pop-top bottle for easy application. All of our products, including the bottles and pop-top caps, are always made in America. Are you a more ambitious grower? Check out Kryptonite Quad pack! Kryptonite Big 470 Pack includes both Kryptonite Naked Bong Cleaner 470ml and Kryptonite Cannabis Extractor Cleaner 470ml for those cannabis growers who also like to consume. For the more ambitious growers out there, check out our Kryptonite Quad pack! Why settle for anything less than the best? Klear Kryptonite Big 470 Pack delivers two (2) 470ml bottles of Kryptonite. 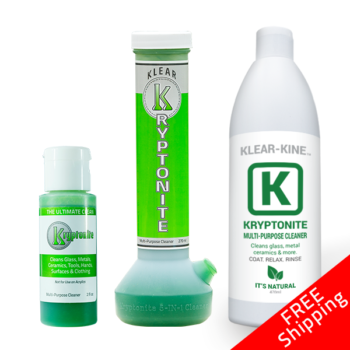 One 470ml bottle of Kryptonite Naked and one bottle of Kryptonite Extractor Cleaner with Flat Rate shipping in the U.S.A.
All of our products including the bottles we use are always made in America. All of our Klear Kryptonite cannabis accessory cleaning products have the lowest VOC of any cannabis accessory cleaners on the market today (<3% VOC). 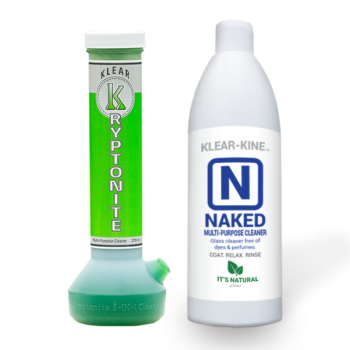 Our Kryptonite Naked Glass and Bong Cleaner is our same great original formula with no added color or fragrance comes with our new convenient pop-top bottle for easy application each and every time. can be used on oil rigs, glass pipes, water pipes, bongs, extraction tubes, dab rags, dab nails, quartz bangers, glass and other hard metal surfaces, sinks and so much more! Kryptonite Cannabis Extractor Cleaner is Kryptonite’s strongest formulation to date and also comes with our new and improved pop-top bottle for easy applications. Formulated and engineered to remove plant matter, concentrates, wax, resin, and tars. 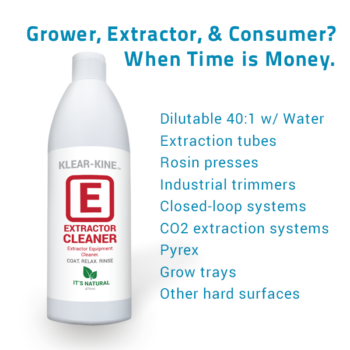 Kryptonite Extractor Cleaner can be diluted to meet all of your growing needs and cleans rosin presses, industrial trimmers, C02 extraction systems, grow trays, Pyrex, extraction tubes and other hard surfaces.